In 1962 The Westinghouse Corporation made a documentary film exploring the state of the nation as Britain continued to register the aftershocks of war, adjusted to the loss of empire and witnessed the erosion of its status as a world-class industrial nation. Designed for the better understanding of American, Canadian and Australian audiences, the Brits hated it when it was broadcast here – perhaps we didn’t like the somewhat portentous tone – but today it looks like a pretty accurate portrait of what was going on. The makers of “Postscript to Empire Britain” also recorded the voice of one important figure in the history of East End activism, which would never have been heard again, if they had not captured it for us. About six minutes in we catch sight of Mrs. Nellie Cressall as she enters Mr. Hart’s grocery shop at 114 Manchester Road, The Isle of Dogs. The voice-over describes her, incorrectly, as a former mayor of the Isle and she has been drafted in to exchange opposing views of its inhabitants with the grocer. Mrs Cressall speaks clearly about the virtues of her close-knit, working class community, whereas Mr. Hart bemoans the people’s narrow perspective and unwillingness to adapt to the changing world beyond the Isle. Mr Hart gazes steadily at the camera as he speaks, while Mrs. Cressall scans his face as she weighs up his words and carefully considers her responses. She has shrewd eyes. Nellie is the epitome of working- class pride and respectability in her smart two-piece costume and matching veiled hat, finished off with an elegant two-tone handbag. Nellie appeared in “Postscript to Empire Britain” at the age of 78 when she had been living in Macquarie Way on the Isle of Dogs for nearly forty years. 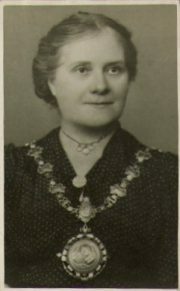 She did indeed hold the office of mayor, for the London Borough of Poplar on behalf of the Labour Party in 1943, but she was part of a much broader history of activism in the East End of London in the first decades of the Twentieth Century and played a significant role. Her career as an activist began in 1906 when she joined the Independent Labour Party. In 1907 Clement Attlee, future Prime Minister, came knocking at the door of her home in Tomlin’s Terrace intent upon forging a link with the local Labour Party, and so began a friendship which was to last all their lives. Through her work with George Lansbury, leader of the Labour Party between 1932-35, she met Sylvia Pankhurst who had arrived in the East End in 1912 to support his unsuccessful campaign to enter Parliament on the Votes for Women ticket. In 1913 Nellie joined Sylvia’s newly established East London Federation of Suffragettes. Nellie’s motivation was quite simple. She could not understand why mothers weren’t allowed make important decisions over their children’s lives, such as authorising vaccinations, which fell to the father; why women earned half as much as men for doing the same jobs. She wanted to right these wrongs. Nellie took part in the amazing work ELFS carried out for the people of the East End during the First World War. As well as continuing to campaign for women’s suffrage throughout, they launched a programme to relieve the privations inflicted by war within days of its outbreak. They provided milk for hungry babies and free medical care for children from a network of distribution centres and clinics. Adults could get nourishing meals from the cost-price restaurants they set up. They ran a toy factory where women worked in decent conditions for fair pay and a nursery run along Montessori lines took care of their children while they worked. Unlike their fellow suffragettes of the mainstream Women’s Social and Political Union, ELFS were staunch pacifists who participated in the anti-war movement. Perhaps her finest hour came with the Poplar Rates Rebellion of 1921. In 1919 Nellie and George Lansbury were elected to Poplar Council where Labour held majority of 39 out of 42 seats. Lansbury was outraged that the London County Council levied a precept on Poplar’s rate payers equal to that demanded from the inhabitants of Westminster and Kensington and Chelsea, when Poplar’s residents could afford so little and were in such great need. He refused to pay and was imprisoned along with his fellow councillors: daughter-in-law Minnie, her close friend Nellie, Susan Lawrence, Julia Scurr and Jennie Mackay. Nellie had five children at the time and was far advanced into another pregnancy with her son, Sam, when she went to jail. The prison authorities put her in the hospital wing, where she was locked in a room next to a woman who constantly cried out in distress and another who committed suicide. She was entirely forgotten for twenty-four hours. When reports of this shocking negligence reached the outside, they stirred up sympathy for the rebels and attracted odium to the London County Council and British government. Nellie spent three weeks in gaol. She could have been released sooner but she refused to go, compelled by her sense of loyalty to the others, who were to remain inside for a total of six weeks. In the end, she only left prison at the insistence of Harry Gosling, leader of the LCC’s Labour Group. No-one was more surprised than George Lansbury when Poplar Council prevailed, as he had initiated the rebellion with no expectation of success. Sadly, Minnie never recovered from the ordeal of incarceration. Her health was ruined by a bout of pneumonia while she was in prison and she died a year later, aged 32. A photo of the funeral shows Nellie at the front of the cortege which followed her friend to her grave in the Jewish Cemetery in East Ham. Nellie had the good fortune to go on and live a long life as an activist and become the matriarch of a vast extended family, which included eight children of her own. Nellie herself was born as Nellie Frances Wilson in 1882 and shortly after, the Wilson family moved to Leyton. The next record of her in the 1901 census shows that she worked as an ironer in a Laundry in the years before marriage. Nellie married George Joseph Cressall in 1904 at St. Dunstan’s Church, Stepney. Over the next decade they had five different addresses, where they lived in one cramped accommodation after another with their growing family. Such impermanence was a common feature of working-class life and we might look askance at how families coped with this degree of instability and wonder how on earth they managed, especially when their homes had no sanitation or running water. Nellie was more sanguine and recalled living contentedly in “two nice little rooms” during her years on the move. The final change of address in 1923 was to transform her domestic circumstances. You can read about it in part 2 of this article, together with an account of her later years as an activist.